No Insurance, No Problem. $12.95/month. Schedule your same-day visit in Eagan through this app on a real-time basis! We don't schedule appointments 3, 6, or even 9 months out like other dental offices! You can check available times and much more with our new MyLife Dental app! Whether you’re new to the Eagan area, or simply realized that there is a better way to receive dental care, we are happy to let you know that we have a qualified dentist close by to provide the dental care that you need. There are many reasons our patients choose MyLife Dental, come see for yourself! MyLife Dental wants to be the reason why you smile today! From the moment you walk through the door of our Eagan dental practice, you will encounter an environment of welcome and relaxation. MyLife Dental has demonstrated a proven pathway to better health and well-being. We take pride in improving our patients’ lives by providing an unmatched dental experience, at an affordable price. We offer flexible scheduling and walk-in appointments to make your dental visits convenient to your schedule. 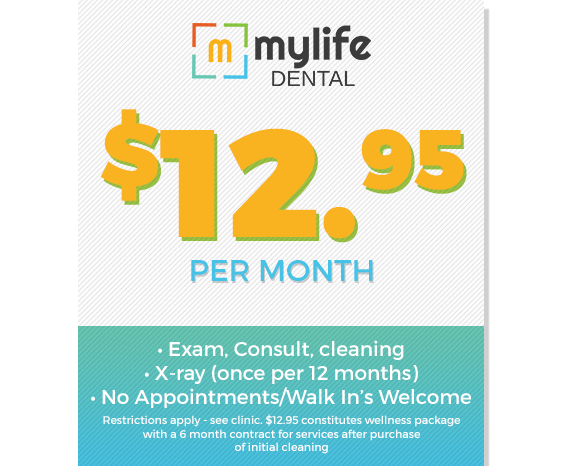 Come and experience the difference that MyLife Dental can offer you! An inviting and relaxing dental office means nothing if the work is less than perfect. Our team of professional dentists at MyLife Dental has the newest and most advanced technology at our disposal. For example, panoramic X-ray allows the dentist to get an even better view inside your mouth, to detect areas of concern at earlier stages. We are able to give you an excellent picture of your dental health using intraoral photography. This type of dental photography allows us to take detailed pictures of various areas of your mouth. At MyLife Dental Eagan, we use all of this detailed information to provide you with the best dental care possible. Information leads to prevention, which is the best dental treatment of all! Appointments are not required, as we fit into your schedule -- mylife DENTAL provides the care you need when you need it. Use our App to check in today! We offer the most affordable dental care option in the market and easy-to-understand pricing: no insurance, no hidden cost. Open on evenings and weekends! Every person leaves with a healthy smile that they can be proud of. Mylife DENTAL has created a new model of modern, customer-friendly dental clinics that has removed significant administrative time and barriers, translating to lower cost and higher quality for our valued patients. Our dental hygienist and dental assistants are led by dentists who use state-of-the-art virtual care technology. We have priced our services below industry standard pricing by 20-50% for preventive services and below most insurance plans. You will notice the difference at MyLife Dental from the moment you walk in the door of our Eagan dental office. Our friendly front-office staff will greet you with a smile and put you at ease as you relax in our comfortable waiting room. After you have been brought back to the exam room, you will have the choice of listening to the radio, or watching a show on television. You now have the option to check in and complete new patient forms prior to arrival when you download the MyLife Dental app. At MyLife Dental Eagan, we know your time is valuable and we are always looking for ways to streamline the process of appointments so that we can make your visit to our dental office as smooth as possible. Both our front office and dental staff have been selected and trained to provide the best customer service. We have even introduced walk-in appointments! Whether you choose to walk in for an appointment, make an appointment using our app, or schedule over the phone, we hope that you will experience the MyLife Dental difference. From start to finish, it’s unlike any dentist office that you’ve ever experienced. Call today to learn more! ©2018 Mylife DENTAL | All Rights Reserved.